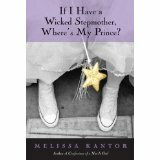 Book: If I Have a Wicked Stepmother, Where’s My Prince? I was delighted to win this book from the author. When you hear the title – If I Have a Wicked Stepmother, Where’s My Prince? – what do you think of? Probably the first thing that comes to mind is Cinderella. And you are not far off. The main character in this enjoyable book feels as if she is being treated like a Cinderella; even her new friends think so. When Lucy’s mother died, leaving behind her husband and young daughter, it meant it was just the two of them for several years. Then her dad remarried and moved them to live in another city with his new wife and her two (younger-than-Lucy) daughters. Lucy was relegated to a room in the basement, a very inadequately furnished room, and her dad was hardly ever home because he was still working in the city where they had lived before Lucy’s life was turned upside down. Lucy felt unfairly treated, being expected to do chores the other girls were not asked to do and not treated very nicely. She felt like a .. well, the way Cinderella may have felt. Then she falls for a boy and things just get more complicated. I won’t tell you what happened. ** Possible spoiler alert ** What I will say is .. there is some of the normal temptation stuff, but it’s the drinking that becomes the issue for awhile. It is handled well by the author, Melissa Kantor. You can find If I Have a Wicked Stepmother, Where’s My Prince? listed on my BUY THE BOOK! page. This entry was posted in Mostly About Reading, Reviews & Interviews and tagged Adolescence, Cinderella, conflict, If I Have a Wicked Stepmother Where's My Prince?, Melissa Kantor, Prince, stepmother, teenagers, underage drinking, young adult, young love. Bookmark the permalink.